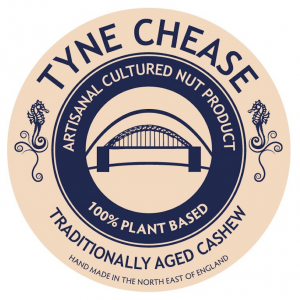 Tyne Chease is a premiere vegan cheese manufacture located in Newcastle upon Tyne. This small but growing company makes some of the best cheese on the market. Next time you are at one of our vegan festivals, come and meet Tyne Chease and taste some of their amazing cheeses. You wont be disappointed. Tyne Chease hand makes artisanal cultured, 100% plant based, organic, gluten free nut based cheeses in the north east of England. Our chease making is inspired by traditional methods going back thousands of years. Our entire range is authentically cultured and matured. We specialise in chease worthy of the finest wines and perfect for a classic cheaseboard, accompanied by crackers, grapes and chutneys. Whether you love chease, follow a plant-based diet, are lactose intolerant or want to cut down on cholesterol, we provides the chance to taste a slice from the cheaseboard of the future. For more information on this amazing company please take a look at their website, facebook or twitter page. Please check to see if this company will be attending out next event, before booking tickets.